We have twelve olive trees, four fig trees, one pomegranate and a couple of as-yet-unidentified trees. 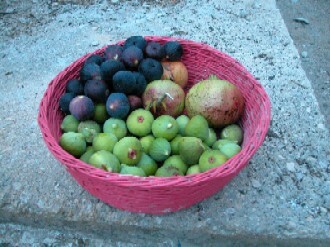 These fruits were picked on Sunday and the black figs were absolutely ripened to perfection, juicy and sweet. Enough to make me change my mind about figs. I suppose you live in England, and you have figs in your garden? I am from Algarve (Portugal), and I thought this was the land of figs,...it's amazing figs grow in cold countries like England! (I found your blog when I search in blogsphere, people who like bridge).